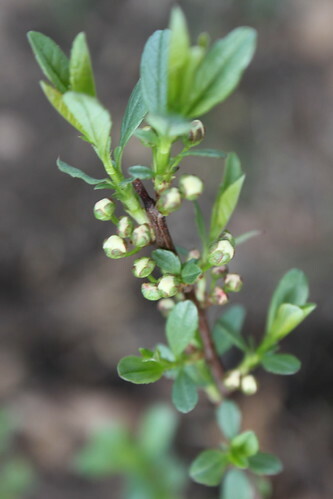 No flower is more welcomed in my garden than the first buds of our fruit trees and bushes. 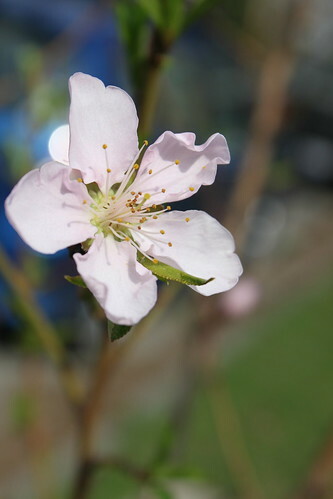 With the warmth of the past few days, the peach trees in the treeyard bloomed. 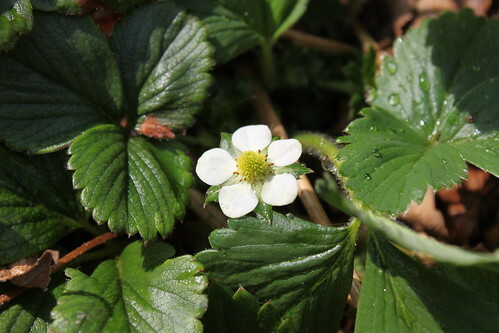 I spotted a strawberry flower in the bed yesterday. These beautiful flowers will soon develop into sweet nutritious fruit. 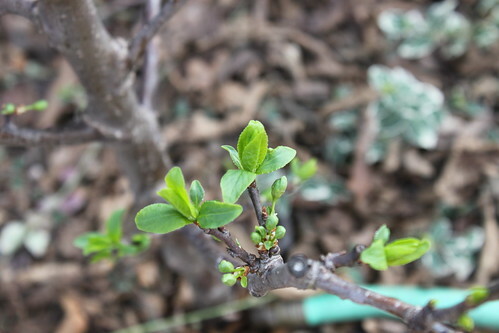 The dwarf cherry has buds just waiting to burst. I have no idea what to expect out of these knee high trees. They are purported to produce edible fruit and time will tell whether that is true. Leaves on the plum tree are unfurling. Because this is the first year for the plum, with a heavy heart I will pinch off any blossoms before they go to fruit. Allowing the tree to grow with no fruit for at least one full season helps it establish roots, branches, and height. 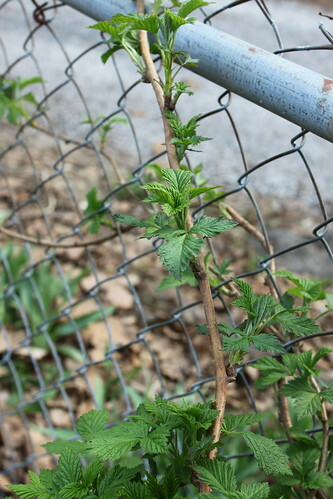 Raspberry vines are growing and leafed out. I buried several vines to establish some new plants. The blueberry bushes are just starting to sent out leaflets. A part of me lives in terror this time of year. A good hard frost can ruin the growing season for all of these fruits. I follow forecasts looking for evening temperatures below 32 degrees. The beauty of living on a tiny urban homestead is that I can cover these trees and plants if there is a frost warning. I pull out sheets and tarps, anchor them with rocks, and give a little protective insulation to my precious fruit blossoms. Once past May 15, the frost free date for central Ohio, I let down my frost guard. The fruits slowly grow. I keep an eye out for pests that might be invading and will treat accordingly, though I've never had any problems. When fruits are just barely mature, changing from chartreuse to full color, my blood pressure rises again. I want the juicy sweet berries and fruit for myself and my family. Squirrels and birds have the same desire. To reap the full harvest, I cover the strawberries, blueberries and raspberries with bird netting. We reuse netting from year to year, getting our money's worth out of the $7 investment. When I am ready for berries, I lift the netting or pick right through it. This will be our first year allowing the peach and cherry trees to fruit. I hope that pests will not be a problem either during development or harvest time. I am armed with information from Mother Earth News and Back to Basics should I need to naturally treat animals invading my micro-orchard. Keeping fruit trees is an emotional process for me. I love fruit so very much that I take special, some might say obsessive, care of my plants. Do you have fruit trees? How do you care for them? We're Slaughtering a Pig. Why?